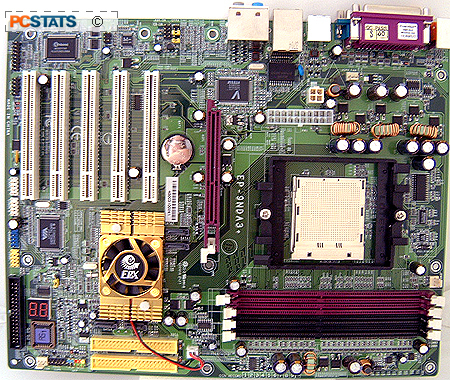 Abstract: The Epox 9NDA3+ Socket 939 motherboard comes with onboard IEEE 1394a Firewire, Gigabit Ethernet, 8 USB2.0 jacks, an additional 2-channel SATA controller. Everyone expected a big battle between AMD's Socket 939 Athlon64 and Intel's Socket 775 Pentium 4, but it seems that this conflict has fizzled out before it even started, leaving the Athlon64 a clear favourite among consumers. On the Intel front, PCI Express components and DDR-2 memory are expensive and do not currently offer any significant performance increases over existing technology; with AMD, things are slow because affordable Socket 939 processors are almost non-existent. On the up side, motherboard manufacturers have been releasing new socket 939 solutions like there's no tomorrow. For AMD enthusiasts, nVIDIA's nForce3 Ultra chipset is easily the most popular Socket 939 chipset. Performance-wise it's about the same speed as the VIA K8T800 PRO, but the one thing in favor of the nForce3 Ultra is the presence of functioning AGP/PCI locks. Based on the nForce3 Ultra chipset, the Epox 9NDA3+ Socket 939 motherboard comes with onboard IEEE 1394a Firewire, Gigabit Ethernet, 8 USB2.0 jacks, an additional 2-channel SATA controller, a 7.1-channel audio and Epox's awesome Port 80 diagnostics card. Two other extras on the board and in the bundle are MOSFET heatsinks and a handy slot/Philips screwdriver. The Epox 9NDA3+ offers users five PCI slots, and one 8X AGP slot for expansion purposes. The four dual channel DDR sockets will support up to 4GB of DDR-266/333/400 RAM, in sizes of up to 512MB per DIMM. The processor socket supports 939-pin Athlon64 and AthlonFX CPUs, and maintains a 2GHz (1GHz upstream, 1GHz downstream) Hypertransport link with the nVidia nForce 3 Ultra chipset. Round back are the jack sensing audio connectors for 7.1 channel AC'97 audio, and one coaxial and optical S/PDIF audio output. 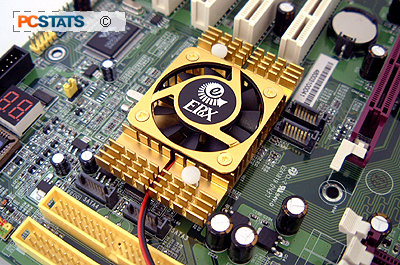 The Epox 9NDA3+ comes with a total of three fan headers, and supports AMDs Cool 'n' Quiet power saving technology. We're accustomed to seeing large Northbridge heatsinks on Intel based motherboards, but that kind of thermal solution has been quite rare on AMD platforms, until recently. The videocard sized cooler on the nForce 3 Ultra chipset seemed to do its job pretty well, as the heatsink stayed around room temperature throughout out tests. The heatsink holes around the NF3 Ultra chipset IC are standard videocard size, so third party coolers, water blocks, or what have you can be installed. Athlon 64s, like their Pentium 4 counterparts, are quite picky when it comes to the type and quality of power they need. If you equip a new machine with an inadequate power supply, you may end up with all sorts of problems, including random reboots, or even data corruption. Epox tries to steer people in the right direction by recommending a 300W power supply, but we'll be a bit more specific. Make sure you get yourself a name brand power supply with a beefy 12V+ rail. It's the most important line and the one that the processor draws its current from. On the software front, the Epox 9NDA3+ motherboard comes bundled with a copy of Pro Magic Plus, Image It 3.0 and a full version of Norton Internet Security 2004. These software utilities will certainly make your life easier, especially in the case of Norton Internet Security which provides essential anti-virus and firewall protection. Along side the Power Pack which includes a small screwdriver and some MOSFET heatsinks, are two purple rounded cables. The cables are quite flexible consisting of individually separated wires, so they are extremely easy to manipulate into place. Pg 2. Does Epox = Overclocking?